Again, I made this primarily with what I already had on hand for the Nachos. To make the nacho meat, I took one package of ground meat and sauteed it until well cooked. Then in a bowl I mixed it with 1 tablespoon of barbeque sauce. I took out about 1/2 cup of the meat and mixed in the Chipotle Tabasco sauce in to it to add kick (knowing the kids wouldn't like it in the nacho meat). I added all of the above ingredients on top of fresh chopped romaine lettuce and added about 1 tablespoon of my favorite salad dressing (which happens to be Chinese Chicken Salad dressing by Girard's). 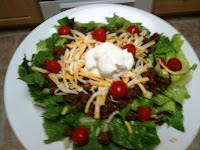 The salad came out amazing and the kids loved the nachos! Perfect way to satisfy the kids and allow me to eat healthily without feeling like I cooked two separate meals! Oh yum! You are a clever cook! I think I am going to have to try this soon.